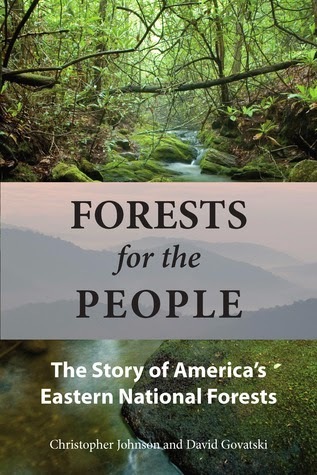 Forests for the People: The Story of America's Eastern National Forests by Christopher Johnson and David Govatski is available at Amazon and Barnes and Noble. Forests for the People tells one of the most extraordinary stories of environmental protection in our nation’s history: how a diverse coalition of citizens, organizations, and business and political leaders worked to create a system of national forests in the Eastern United States. It offers an insightful and wide-ranging look at the actions leading to the passage of the Weeks Act in 1911—landmark legislation that established a system of well-managed forests in the East, the South, and the Great Lakes region—along with case studies that consider some of the key challenges facing eastern forests today. The book begins by looking at destructive practices widely used by the timber industry in the late 1800s and early 1900s, including extensive clearcutting followed by forest fire that devastated entire landscapes. The authors explain how this led to the birth of a new conservation movement that began simultaneously in the Southern Appalachians and New England, and describe the subsequent protection of forests in New England (New Hampshire and the White Mountains); the Great Lakes region (Michigan, Wisconsin, and Minnesota), and the Southern Appalachians. Following this historical background, the authors offer eight case studies that examine critical issues facing the eastern national forests today, including timber harvesting, the use of fire, wilderness protection, endangered wildlife, oil shale drilling, invasive species, and development surrounding national park borders. Forests for the People is the only book to fully describe the history of the Weeks Act and the creation of the eastern national forests and to use case studies to illustrate current management issues facing these treasured landscapes. It is an important new work for anyone interested in the past or future of forests and forestry in the United States. This book is exactly what it says it is: a history of the National Forests of the Eastern portion of the United States. A number of subjects are utilized to portray the Eastern National Forests and the problems they have faced and continue to face, as much of the information in this book is still relevant today. The writing is a bit dry at times, with a text-book like quality, though where the book is dry will depend on what subject the reader likes least - for me, it was the politics with the gas/coal/logging companies. On the other hand, the details about the various flora and fauna of the various parks piqued my interest. I requested a free copy of this book in exchange for a review because I heart trees and I like reading books that have 'West Virginia' printed in them. I was pleasantly surprised to learn that hunters played a role in ending the clear-cutting of Monongahela National Forest. I enjoyed how this book portrayed my state and our involvement with the evolution in the management of the National Forests.